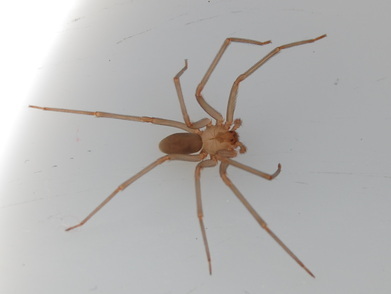 Brown recluse spiders are light to medium brown in color, with black markings that resemble a violin. This type of spider has only 6 eyes, where most spiders have 8. They build webs in dry and undisturbed places, such as sheds, garages, cellars and wood piles. They leave their webs at night to hunt. The Brown Recluse spider is venomous. It is one of two species of spider in Virginia that's venom is dangerous to humans. Click here to learn more about the Black Widow spider!